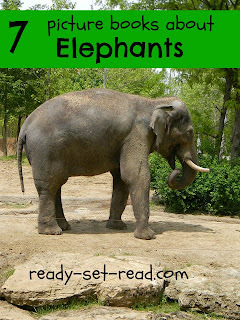 Ready-Set-Read: Books about the Zoo featuring... elephants! Books about the Zoo featuring... elephants! Summer Outings can be a great way to motivate kids to get wild about books. We've been taking "family field trips" this summer that go with our preschool themes. One theme we have focused on is zoo activities for preschool. Of course, we had to take a trip to the zoo. 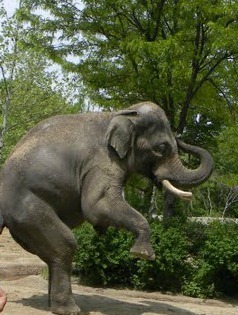 Last week were surprised by an impromptu elephant "show" at the St. Louis Zoo. We just happened to be near the elephant area when a zoo worker was calling out "tricks" for Raja to perform-- and rewarding Raja with well deserved treats. If you are a St. Louisian, you might remember when Raja was just a little baby elephant, who was born at the St. Louis Zoo. Well, here is Raja-- all grown up! Our trip to the zoo sparked an interest in elephants so we took at trip to our library to rumble up some books about the zoo featuring elephant books. Elephants Can Paint Too by Katya Arnold was our favorite elephant book. This book is based on real work that the author did with real elephants. Apparently, elephants can learn to paint, who knew? Some of them paint dots, some paint stripes, and a few even paint flowers or trees. I loved that the text was very simple, yet there were boxes filled with additional information on each page. It made it the perfect book for a wandering 3 year old, yet older kids could really enjoy this book too. Elmer by David McKee is a fiction story of a patchwork elephant, Elmer. Elmer is always the life of the party. Elmer assumes the other animals are laughing at his patchwork and he sets off to become a regular-colored elephant. After he becomes just like everyone else, he finds out life is pretty boring as a regular colored elephant. All the other elephants think he has played a hilarious joke on them by becoming normal colored. I tried this book with Logan a while back and I guess he wasn't ready for it, but now he really enjoys it. I think it sends a great message about accepting yourself as you are, without being "preachy". I dream of an Elephant by Ami Rubinger A rhyming riddle on each page allows readers to fill in the color of each elephant in this multicolored elephant book. I loved the idea of this book. I love books (like Baby Danced the Polka--- one of my all time favorites) that use rhyming + fill in the blank. What I didn't like about this book was that the color of the elephant was never in the text. I felt like I needed to lift a flap or something to "find" the hidden word. It works great as a read aloud. I wouldn't recommend it as an early reader book. I think the text structure is just confusing. Elephant Walk by Jean Craighead George The story of a baby elephant who journeys along with his mother. She protects him and the other elephants by making a variety of sounds and movements to communicate. At the end there is an index of elephant signs. I enjoyed this book. I typically love George's work. Logan and Tyson didn't get into it. It didn't hold their attention at all... .probably too young for it so we'll try again later! Face to Face with Elephants by Dereck Joubert This was a nonfiction text that also was over the heads of the boys. However, it has good photography and I learned a lot from it! by Judy Hindley Can you Move Like an Elephant? was a fun book. It includes not only elephants but also other animals. We've had fun trying to move like wild animals. Can You Move Like an Elephant? One weighs a Ton by Salina Yoon is a counting book that also offers information on wild animals. This is another book that doesn't just stick to elephants but includes a variety of wild animals. Do you know why elephants have such large ears? Read this book to find out! If you take a trip to the zoo (or the jungle), consider taking along one of these picture books for a quick book break while you are out. Also, check out my book adventures page to find other books about the zoo that you might like to take along. More elephant books! I'm going to save these recommendations for next time. Are you close to STL? My husband grew up in central IL and is a big Cardinals fan. We've talked about going to the zoo the next time we're down that way (as well as a game). I think you've convinced me to give it a try! What fun! I wish we had a zoo close to us.. my animal lover would love that! How cool that you got to see that elephant show! The baby elephants are pretty adorable, too, and I love your idea of bringing along a book for a quick break! Thanks for visiting my blog. I am now following yours, because I love reading blogs! This is a great list of elephant books. What a wonderful list of books! My son was nuts about elephants last fall (now it's dinosaurs). We loved reading Elmer but I have a couple new ones for my list now (I Dream of an Elephant and Can U Move Like an Elephant). Thanks for coming over for a visit!